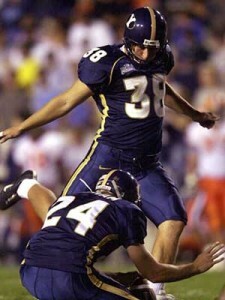 The original “House of Payne” and “The Payne Train”, Matt Payne rewrote the BYU record books as a kicker from 2001-04. He punted deep, nailed 95% of his PATs, and owns six of the ten longest field goals in BYU history. But he’s not your “normal” kicker. 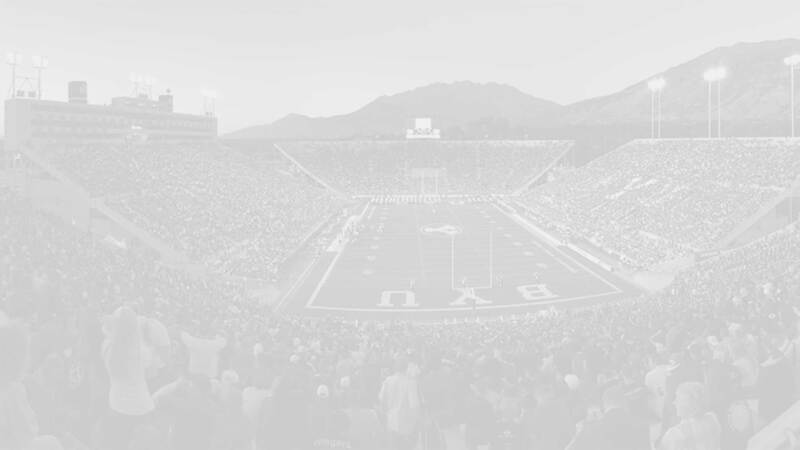 The 6-4, 234 pound former lineman was best known for his time at BYU as the kicker who instilled fear in the opposing MWC kickoff and punt returners. In addition to his accurate field goal kicking and deep punts he was a fearsome tackler and pseudo-fullback. He had 25 career special teams tackles, was 1-2 passing for 12 yards and a TD, had one yard receiving, and a couple rumbling fake punts that went for first downs (48 yards rushing). And top all that he set two NCAA and several BYU kicking records. Hailing from North Ogden, Utah, Matt was the sixth of nine children. Not to get lost in the crowd Payne has said that he always felt supported by his parents who provided him plenty of opportunities to play sports. He attended Weber High School where he as an all-state selection in soccer and basketball and a two-year letter winner in football (as a middle linebacker and kicker). He attained the rank of Eagle Scout when he was only thirteen. As a kid Payne always wanted to play for the Cougs and hoped to get a shot to become the next great BYU quarterback. He was recruited by Air Force, Arizona, California, Northern Arizona, Utah, Utah State, and Washington State. Following an LDS mission to Portland Oregon (1997-99) he suited up for the Cougars in 2001. Payne is certainly one of (if not THE) most decorated kickers of all-time for the Cougs. 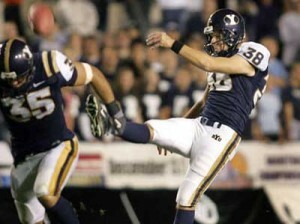 He holds several BYU kicking records and even set a few NCAA records. But he is best known for his ability to “bring the heat” to the opposing kickoff and punt returners. Payne redshirted the 2000 season but competed in all 14 games in his 2001 freshman season. In his first game as a cougar he tied the BYU single-game record for successful extra-point attempts (10). As a sophomore he ranked second in the country with 51 punts for a 47.6 average, which was also the second best average in BYU history. That season he also had a 28 yard run against New Mexico and two impressive special teams tackles versus Boise State. As a junior he recorded eight special teams tackles. As a senior Payne garnered All-American recognition as he led the nation with 51 punts (48.0 yard average) and was named as a Ray Guy and Lou Groza Award Semifinalist. He had another fake punt that he ran for 20 yards against Air Force. During his career he had eight field goals of 50 yards or more with zero blocked field goals. His career PAT completion rate was 95.2% (150/156) and as a punter he had 8713 career punting yards on 192 punts (45.4 average) with a career long of 79 yards. Following his senior season he was invited to the NFL combine but was not selected in the 2005 NFL draft, despite being listed on most boards as the #2 kicker available (Mike Nugent, the number one kicker, was selected in the second round). 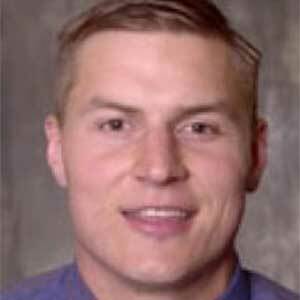 Not to be confused with the other Matt Paynes of the world (sports writer, photographer), Payne the kicker received his bachelor’s degree from BYU in exercise science in 2005 and after a failed attempt to sign an NFL contract turned to a career in pharmaceutical sales. He has done well in that industry steadily climbing the sales ladder for the last several years. He is currently working as a district sales manager for Sanofi, an international healthcare provider with an office in Ogden, Utah. Payne married his high school sweetheart, the former Amanda Lindley (July 2000) and they have at least one child (son Logan). Kicker on the cover makes BYU hopeful, Punter Matt Payne likely All-American – Jeff Call, Deseret News, August 17, 2003.